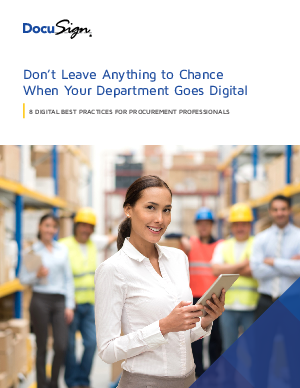 Today’s procurement leaders are using technology to achieve greater procedural and financial efficiencies, secure the best products and services, and improve vendor relationships. However with the lack of technology to boost efficiency and strengthen the partnership with vendors and employees, saving costs and speeding up procurement processes can be quite cumbersome. Industry experts predict that successful businesses will soon become 100% digital for all transactions. The challenge is how to “go digital” in the right ways. Download this best practices paper to learn the eight important ways that procurement teams can make meaningful progress in their digital transformations.